Anna Cherer (LA ROCHELLE, France) on 1 February 2018 in Architecture and Portfolio. 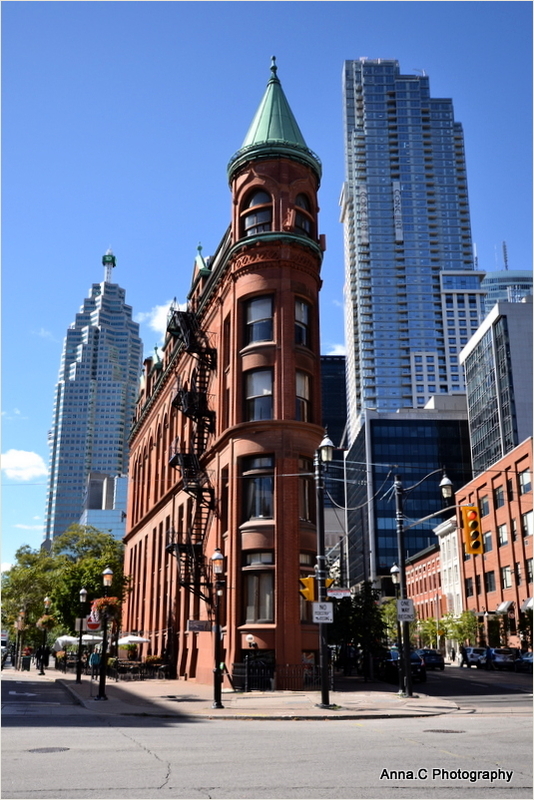 The Gooderham Building, also known as the Flatiron Building, is a historic office building. It is located on the Old Town District, in the St. Lawrence Market neighbourhood. Completed in 1892, the red-brick edifice was an early example of a prominent " flatiron building ". Celui-ci a la couleur "potiron".... ça rime et ressort bien sur tes bleus. A great image. I know the building well. Il est adorable ce petit bâtiment étroit et rouge avec son petit toit vert qui lui fait comme un chapeau, je le vois très bien faire la vedette dans un dessin animé, j'aime aussi les escaliers de secours sur le côté et les vieux lampadaires qui l'entourent! Très belle image et merci pour le texte qui l'accompagne! Très belle journée et gros bisous! Ah, she comes up fresh every time . . a favorite. quelle vue cet bâtisse fine rouge au milieu des deux building grandiose compo et vue. A wonderful photo of one of the city's well preserved gems, and a sweet blue sky to frame it well. That is such a beautiful and unusual building. Thanks for the info as well. Great capture of this building with beautiful color and light!! Thank you for the background information. A beautiful image of this old building that fits its space very well. Such a curious design for these 'flatiron' structures. Nice perspective on this conspicous building, and a striking contrast to the modern high-rises! It is a cool building. Nice shot of it. J'ai d'abord cru que c'était celui de New York. Un sacré bâtiment qui fait presque tâche au milieu de ces buildings.